I've been waiting to release Soutache Set... and here you go! Originally published in January 2012's issue of Creative Knitting, copyright has now reverted back to me! Soutache Set is based on four strands of beaded i-cord that are braided together. This easy elegant set will allow you use up a bit of luxury yarn OR your leftover sock yarn and get you building a bead stash as each i-cord strand has a different color bead on it. A video tutorial is included for working the beaded i-cord stitch making this a great first beading project. Soutache reminds me of the sailor rope bracelets my brother and I used to get as kids that we would wear ALL summer long... but it's a bit more refined, don't you think? When I knit Soutache Set for Creative Knitting I used some Madeline Tosh Sock I had from another project. When I went to knit a few other versions (anybody noticed that I'm not very good at just making one of my designs?) I went stash diving! 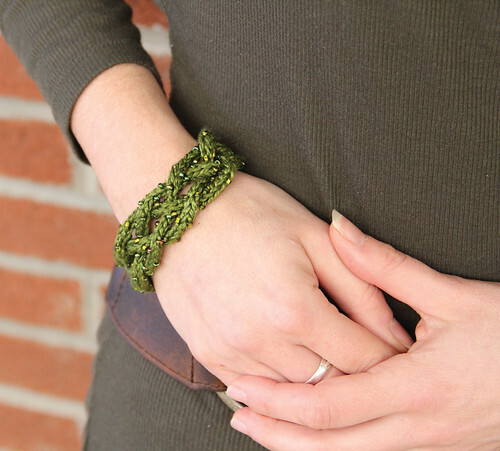 This cuff is made with one skein of Planet Earth's Silk needlepoint thread. I was in a yarn/needlepoint store in South Florida and fell in love with their wall of Planet Earth. I realized it was the PERFECT weight for jewelry and I loaded up on some mini-skeins.I've been wearing this cuff on and off since the photoshoot... and it's officially "mine!" The necklace is made with some Fleece Artist merino 2/6 I had in stash. I had such fun choosing coordinating beads for this version... the variegated blues and gunmetal grey's in my bead stash were more than happy to be played with. You can already see other versions of Soutache on Ravelry... I love seeing what yarn and bead combo everyone has chosen! You can purchase Soutache here, on or Ravelry here. I just bought this pattern today at a wonderful yarn store (Another Yarn in Winchester, Mass.) and cannot wait to make it!